An impulse sealer heat-seals objects by sending high current on impulse to a heater ribbon, equipped on the surface of the heat-sealing blade, to generate heat that enables thermal-sealing through thermal conductivity. The section to be sealed is placed between the heat-sealing blades, pressed and thermal-fused when current and heat are delivered on impulse through the heater ribbon. After the current stops the seal remains under pressure to cool and to give it a clean finish. What’s So Good About An Impulse Sealer? This is no warm-up period after turning it on. Constant heat sealer requires waiting time for the hot bar to heat up. This also means additional power is wasted. Electricity for the heater is only used during the sealing process. Constant heat sealer must maintain the sealing bar hot at all times. Power is constantly drained as long as the switch is on. No component is always hot. Constant heat sealer maintains the sealing area hot at all times, exposing the user to a higher risk of accidentally touching the hot bar. Cooling and fusion takes place under pressure. Constant heat sealer merely provides heat, leaving cooling and fusing process to take place while the package material is shrinking. This results in a rather uneven finish. Our machines seal the openings and loose ends of plastic packaging materials (such as bags). In addition to impulse sealers, sealers include the constant heat sealer, the ultrasonic sealer and the high-frequency sealer. Sealing at an ideal temperature while maintaining the desired setting. High-precision sealing: heat temperature to melt film and cool at temperature to solidify film. How does an Onpul Sealer work? Onpul Sealer controls heating temperature by directly measuring the heater temperature using a low-pro file temperature sensor that comes in contact with the heater. Operating for an extended period caused a melted-film seal. You know the film-fusing temperature, but cannot set the heater temperature to it. The sealing finish differs from the initial finish after a prolonged use. If you have any of the above problems, Onpul can help! You can’t afford to have sealing failures caused by changes in the heating temperature. You need to male a prolonged, continous use of the sealer for volume production. You need to maintain consistent precision and strength of the seal. What does the word “Onpul” stand for? Is it English? Japanese? How does it differ from other sealers? Because it can be operated using bare-minimum heating, it is energy-efficent and labor-efficent. It also reduces wear on the parts. All of our other products are designed to set the heating time (timer); heating temperature can only be set with an Onpul. The biggest feature of the ONPUL Sealer is the ability to set the ideal sealing condition. 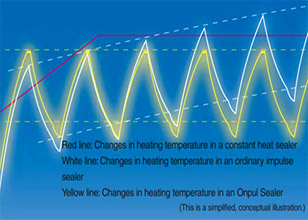 The heating temperature is set by controlling the temperature through the use of a high-sensitivity temperature sensor and by microcomputer-control. The heating process can this be completed at the film-melting temperature without being affected by an increase in the air temperature or machine temperature. Which one of the basic sealers is for you?